DJ Talent Started his tv Career in 2005. when he went on the itv show Jeremy Kyle. before he went on the Jeremy Kyle show he had a massive make over. 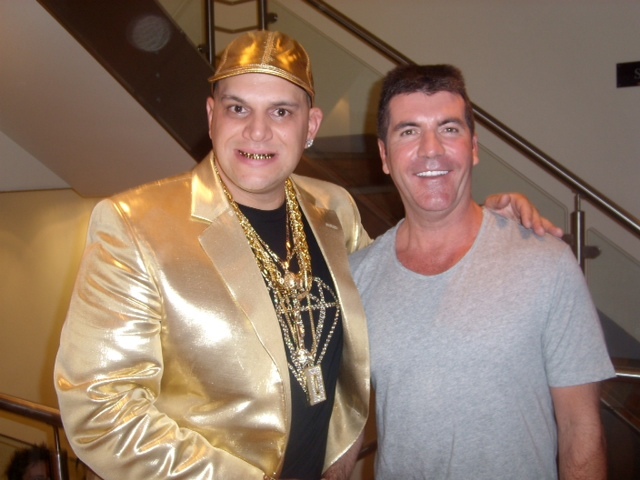 DJ Talent had all his natural teeth filed down and has now got 28 gold teeth. DJ Talent also lost 7 stone in weight and has now got 7 tattoo's. I just feel to be successful in the media business you have to stand out and be unique and different. When I was younger I always wanted to go to shopping center's and local places and wanted people to know who I was. When I was at school teachers and class mates were jealous of me and put me down because my dad was a successful business man and we lived in a nice house. In 2007 I went to Africa with the bbc and did a tv documentary about the gold mining industry. because of my gold teeth and trademark. The tv production company wanted me to see how the African people suffer in the gold mines for my gold teeth. It certainly raised awareness for me and I saw how people suffer in the 3 rd world of polluted water and starvation. Making the documentary about the gold mining industry was very similar to watching the film Blood Diamond. Diamond and gold mines in Africa and really bad conditions. After I came back from Africa I got a call from C4 and I was asked would I like to go on the C4 Friday night Project with Kanye West. I said yes and went on tv with Kanye West and asked him "Kanye how do you become a successful artist" ? He said a lot of artist put there music on MySpace and it is all from there so many artist get signed on MySpace. I then said " Kanye can I perform a rap for you ? " I started Rapping and the tv audience and Kanye went Crazy and it was all from there I started getting known in the music business . I sampled Kanye West Vocal on a track and I Produced a big record called Dj Talent Bad Boy Remix and I sampled the morning itv tv chat show host Jeremy Kyle. I found for me sampling famous people in the media and who are on tv creates a stir. It is a good way of getting your name out there in the public eye. My Britain's got talent experience was amazing meeting the judges Simon Cowell, Pier's Morgan, Amanda Holden, Kelly Brook. I went to the Manchester auditions and performed my famous chorus I wrote. I say Britain, you say talent, Britain's, got talent , it is the Dj Talent. Piers Morgan said I have seen what you have done there very catchy, Simon Cowell said I thought it was horrific but I got to know the chorus after 4 seconds, Amanda Holden said that could be in the charts. That performance made me extremely famous and lots of famous people were singing my Chorus, Piers Morgan, Fearne Cotton, Scott Mills, Keith Lemon, Andy Peters were singing my chorus and Ant and Dec, plus more celebrities. From there I did tv interviews on This Morning, Gmtv, BBC Radio 1 and I went on tour with Susan Boyle, Stavros Flatley, and diversity. that was a massive year in tv Showbiz. Susan Boyle became the fastest selling platinum album artist in Britain over night. That year 2009 was the most hectic year of my life I went travelling to Australia, New Zealand, Thailand. I got back and performed in the semi final and went on a big uk tour. Playing in Belfast, Dublin, Edinburgh , Glasgow, Cardiff, and Wembley arena. That was the best experience of my life. I went on the itv 2 show Celebrity Juice with Keith Lemon, Holly Willoughby, Fearne Cotton, Louise Rednapp. I also went on the C5 program the Mathew Wright show. Jonny L and Brian Harvey and Andy From True Steppers said with those gold teeth you should get yourself onto tv screens and be a character. My sound Engineer Jkl gave me the idea to sample Jeremy Kyle and it caused a stir and people were talking a gold tooth Rapper has sampled tv chat show host Jeremy Kyle. I think in life if you want to be successful it is all about being around good people with a great influence.